1.What is the difference between the X3 and ZENMUSE X5 Series? The X3 gimbal and camera system is included with Inspire 1 and has 1/2.3” sensor, enabling it to shoot 4K video and capture 12 Megapixel photos, with an ISO range of 100-3200. The new ZENMUSE X5 Series camera and gimbal systems are the world’s first Micro Four Thirds (M4/3) cameras made specifically for aerial photography and videography. The M4/3 sensor is eight times the size of X3 camera and enables high quality, high sensitivity image recording at an ISO range of 100-25600. The ZENMUSE X5 cameras capture 16 Megapixel images with stunning details and records 4K video. With 12.8 stops of dynamic range, shadows and highlights in everything you capture is brought out in perfect clarity.The ZENMUSE X5 has a M4/3 lens mount which gives your photography flexibility by letting you change lenses. Currently, there are three lenses for the ZENMUSE X5 M4/3 lens mount: the Panasonic Lumix 15mm, Olympus M.Zuiko Digital 12mm and DJI MFT 15mm. 2.What’s the difference between ZENMUSE X5 and ZENMUSE X5R? The biggest difference between them is in video recording capabilities, storage media, and workflow. 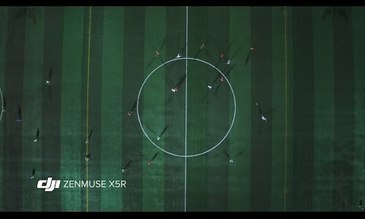 The ZENMUSE X5R shoots video in lossless format to preserve maximum detail and enable precise editing and post-processing, giving cinematographers full control over the look of their footage. The ZENMUSE X5R has an integrated 512GB SSD drive for storing the lossless video recorded. DJI has designed an editing software specifically for lossless videos, enabling high-end filmmakers to easily edit and process the videos according to their own needs. 3.What is the advantage of the ZENMUSE X5 Series, compared to other M4/3 cameras in the market? The ZENMUSE X5 Series are the first M4/3 cameras designed specifically for aerial photography. The cameras come with an integrated 3-axis gimbal stabilization system, and are designed for use with the Inspire 1. The camera shoots 16 Megapixel photos and 4K video, and can be fully controlled via the new DJI GO app. 4.Can I use the ZENMUSE X5 Series separately as a stand-alone camera? No. The ZENMUSE X5 Series cameras must be used together with the Inspire 1 or future supported DJI products. 5.What DJI aerial systems can the ZENMUSE X5 Series be used with? The ZENMUSE X5 Series is currently compatible with the DJI Inspire 1 and the Matrice 100. More compatible products will be available in future. 6.What are the benefits of the M4/3 sensor? The M4/3 sensor is eight times larger than the sensor in the ZENMUSE X3, enabling it to capture incredibly detailed images and videos, including UHD 4K, and gives it improved low-light performance. The M4/3 lens mount allows the use three lenses currently. 7.What is the M4/3 mount? The M4/3 lens mount is the interface between the camera body and the attached M4/3 lens. Thanks to the standardized M4/3 mount, you can select three lenses currently. The size of M4/3 is between the size of super 35mm and super 16mm, and super 35 mm lenses can be added to the MFT mount which enables you to shoot high-quality aerial videos. 8.What lenses are compatible with the ZENMUSE X5 Series? Currently, there are three prime lenses compatible with the X5: the Panasonic Lumix 15mm, Olympus M.Zuiko Digital 12mm and DJI MFT 15mm. 9.Why aren’t all MFT lenses compatible with the ZENMUSE X5 Series? To ensure that the 3-axis gimbal’s movements are unrestricted, the lenses are required to fit the gimbal in terms of weight and size. Not all existing lenses fit these requirements, which is why not all MFT lenses are compatible with the ZENMUSE X5 Series. 10.What is the DJI GO App, and where can I download it? 11.How do I install the ZENMUSE X5R on to the Inspire 1? If you have an Inspire 1 with a ZENMUSE X3 installed, the mounting mechanism should be changed to the new one that's included with the ZENMUSE X5 series. The new mounting mechanism that's provided with ZENMUSE X5 Series are also backwards compatible with the Zenmuse X3 camera. 12.Why does the ZENMUSE X5R have an integrated SSD drive, but not the ZENMUSE X5? Because the ZENMUSE X5R's footage captured is lossless and uncompressed, it requires a large amount of memory for storage. We offer a 512GB SSD with the ZENMUSE X5R for this reason. 13.Can I remove the lens hood when using my ZENMUSE X5 with the designated lenses? It depends on the lens used. The 3-axis gimbal is sensitive to the weight of the mounted lens. When you are using an Olympus M.Zuiko Digital 12mm, the lens hood can be removed without disturbing the gimbal’s operations. However, if you are using a Panasonic Lumix 15mm or DJI MFT 15mm, the lens hood must be attached. For more detail, please go to the download page for official guidance. 14.Can DJI GO display my recorded photos and videos? Yes, you can view your photos and videos by going to the Library in the DJI GO app. 15.Can I use DJI GO to edit my photos and videos? Yes, you can go to the Library and find the video and photo editor. 16.How do I use auto focus on the ZENMUSE X5 Series? To focus on a specific area, all you have to do is to tap on the screen of your mobile device just like the way you are using it on a smartphone. 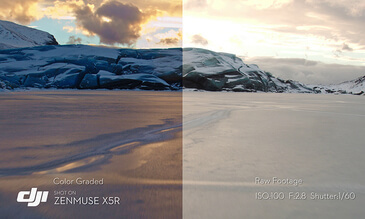 17.What are the available exposure modes on the ZENMUSE X5 Series? Auto, Aperture Priority, Shutter Priority and Manual Exposure. 18.Can I zoom when using the ZENMUSE X5 Series? Yes. Specified zoom lenses are supported for photography only. Find out more in Supported Lenses section of the specs.